what are all those red star-looking things? Lights on buildings so planes can see them. 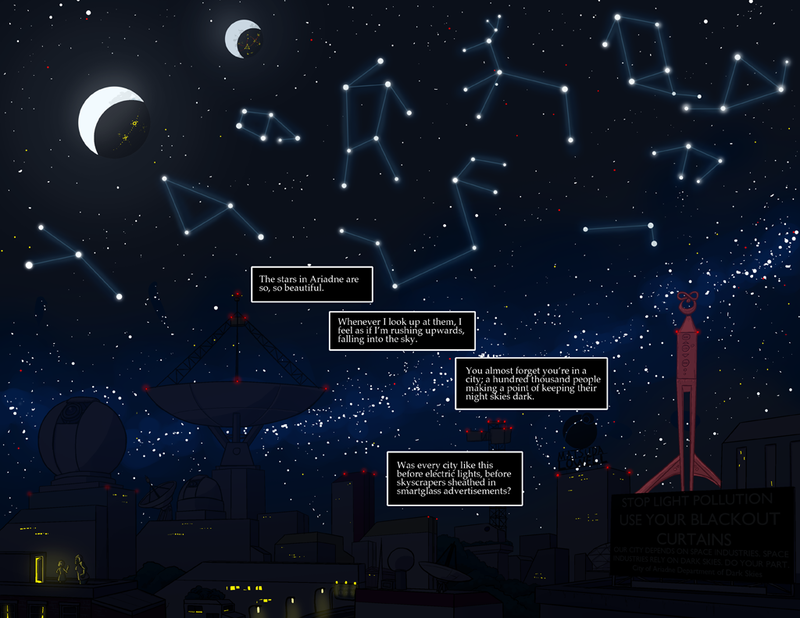 No, if you look above the buildings, some of the lights in the sky, among the stars are red. Those are probably meant to be planets. Like when you can see Mars. theyre not planets; theyre not along any sort of ecliptic! A fair number of the star-objects are different colors/shades. I’d assume it is common everywhere, but where I grew up there was enough atmospheric disturbance/rippling (and there was no light-scatter) that not only did some stars appear different colors but some of the brighter ones would ripple/flicker through different colors. Very beautiful. I wonder if those moons rotate relative to the sun, giving them night and day? Do they rotate relative to Iothera, presenting different faces to the planet? That’d be pretty hilarious, but those lines aren’t literally there, it’s just to show where Cassandra’s tattoos come from. Is that another one of the Seb red towers? interesting. I hope we learn more about this world’s history in greater detail– namely how long it’s been since Seb civilization disappeared.